Fancy a dark blue laptop, widescreen display, full-size keyboard and AveraBrite screen technology for just £799? Hell yeah! 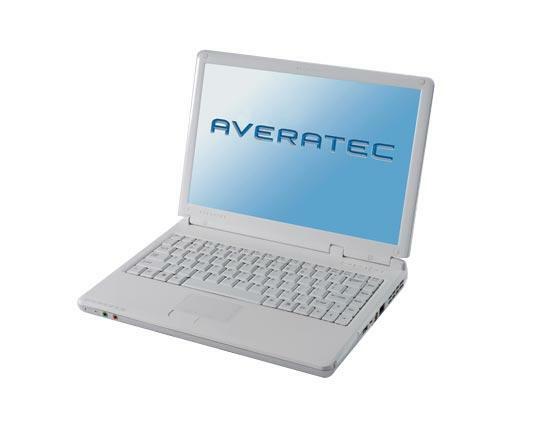 Averatec has added to its range of stylish, colour-coordinated, slimline laptops with the 13.3-inch widescreen 4155. It has a striking dark blue cover but in stark contrast, the interior is brilliant white. The design, we’re sorry to say, is a little childish and certainly lacks the chic appeal of other ultra-portables, especially those from Apple and Sony. Thin & light widescreen laptop, but it lacks power under the hood. As with the 1050 model, Averatec's new 4155 notebook has clearly been influenced by the Apple design team. The £799 price tag suggests it's not going to generate a benchmark meltdown, but hats off to Averatec for creating a stylish, portable laptop. Inside the reasonably light 2kg chassis is an AMD Turion 64 Mobile MT-30 processor that runs at 1.6GHz and has 1MB of L2 cache. Partnered by 512MB of PC2700 DDR333 Ram, it made for an overall Sysmark 2004 SE score of 119 and a result of 1,141 in PCmark05. Intel Graphics Media Accelerator (GMA) 900: Mobiler onboard (shared Memory) Grafikchip (auf Mobile Intel 915GM Chipsatz), ohne Hardware T&L - kaum spielefähig. Für Office und andere Anwendungsprogramme ohne 3D sehr gut geeignet. 3D Spiele sind auf diesen Vertretern nur in Ausnahmen spielbar, grundsätzlich sind die Grafiklösungen hierfür jedoch nicht geeignet. Office Programme und Internet surfen dürfte jedoch ohne Problem möglich sein. » Weitere Informationen gibt es in unserem Notebook-Grafikkartenvergleich und der Benchmarkliste. MT-30: » Weitere Infos gibt es in unserem Prozessorvergleich Vergleich mobiler Prozessoren und der Prozessoren Benchmarkliste .